← Asian Carp Invasion: Time To Build A Wall? 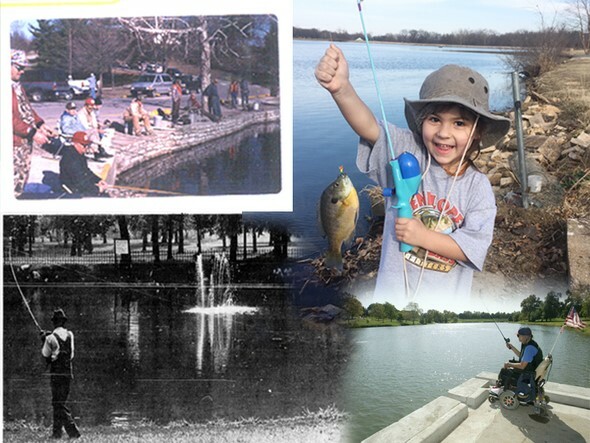 What started out mainly as a warm weather fishing program got a cold weather boost in the early 1990s when winter trout stocking and fishing were added. The UFP also eventually lead to funds for lake and habitat improvements being made available in the form of cost-share arrangements with city and county partners. These Community Assistance Program agreements created both better accessibility for anglers and habitat for fish, in many cases developing self-sustaining populations of sportfish such as bass, bluegill and crappie. Competition among metro area high school angling teams will continue in the Fish St. Louis Cup (#FISHSTLCup), as the series of fishing challenges culminate in tournament finals this spring. This entry was posted in Home, Outdoor/Nature and tagged MDC, St. Louis Fishing, Urban Fishing, Urban Fishing Program, Urban Program. Bookmark the permalink.